The Palram 8 ft. x 12 ft. SkyLight Shed is ideal for storing, organizing and protecting your outdoor life. Palram SkyLight sheds were developed and built to last; they do not fracture, bend or discolour, and withstand extreme weather conditions such as hail and high temperatures. Made with Palram's virtually unbreakable Polycarbonate and reinforced aluminum frame, the SkyLight Shed will provide years of maintenance-free protection. At first you may wonder about the flexibility and thinness of the Polycarbonate panels, but rest assured that once assembled, the shed will be rigid and durable. The unique SkyLight Polycarbonate roof panels transmit natural sunlight throughout the day while having an opaque external visibility for maximum privacy. Front and back vents are included for ample airflow. Designed with your outdoor needs in mind, the SkyLight Shed will compliment your home and enhance your outdoor living space. The Cabana is an excellent multipurpose garden shed. It is ideal as a playhouse, pool side retreat, workshop or a storage building for garden or pool equipment. This beautiful panelized Western Red Cedar Do-It-Yourself-Kit does not require dangerous and time consuming cutting. With manageable panel sizes it is quick and easy to assemble. BEFORE ORDERING Check with your local building, zoning, and neighbourhood association to obtain all applicable permits. The Suncast vertical storage shed is great for storing long handled tools and garden accessories. The contemporary design will complement any backyard decor. Built-in support will accommodate up to 4 shelves (sold separately). Double-wall resin construction is durable and long lasting. It includes a reinforced floor for heavier items. Padlockable door for extra security. Fast and secure 'Easy Bolt' assembly. 8 ft. x 12 ft. SkyLight Storage Shed The Palram 8 ft. x 12 ft. SkyLight Shed is ideal for storing, organizing and protecting your outdoor life. Palram SkyLight sheds were developed and built to last; they do not fracture, bend or discolour, and withstand extreme weather conditions such as hail and high temperatures. Made with Palram's virtually unbreakable Polycarbonate and reinforced aluminum frame, the SkyLight Shed will provide years of maintenance-free protection. At first you may wonder about the flexibility and thinness of the Polycarbonate panels, but rest assured that once assembled, the shed will be rigid and durable. The unique SkyLight Polycarbonate roof panels transmit natural sunlight throughout the day while having an opaque external visibility for maximum privacy. Front and back vents are included for ample airflow. Designed with your outdoor needs in mind, the SkyLight Shed will compliment your home and enhance your outdoor living space. 8 ft. x 12 ft. SkyLight Storage Shed is rated 4.3 out of 5 by 3. Rated 5 out of 5 by Chiefsfan23 from This shed was easy to assemble with just a couple people. The quality is excellent and sturdy, w... This shed was easy to assemble with just a couple people. 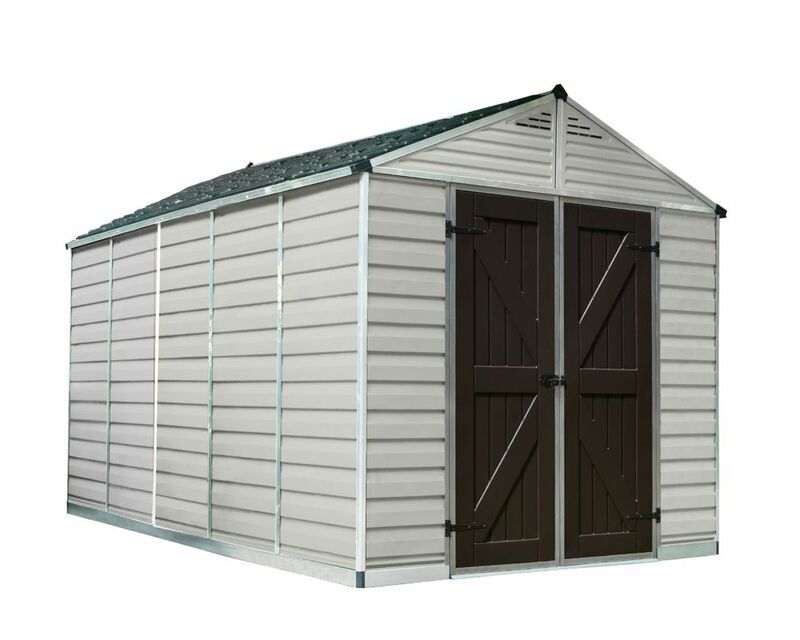 The quality is excellent and sturdy, would recommend this shed to others! Rated 4 out of 5 by teamdoomsday from Ordered this shed and it was delivered in 7 working days as promised. It took my 2 sons and mysel... Ordered this shed and it was delivered in 7 working days as promised. It took my 2 sons and myself 3.5 hours to install. With the heavy winds we got early this year the shed was not phased at all. Good investment and my garage is now clean. Rated 4 out of 5 by Amber from When I watch the videos of "how to" before I... When I watch the videos of "how to" before I purchased it showed a floor. This was quite misleading as when it arrived there was no floor just a frame. I was disappointed to also find out almost immediately that it also leaked water badly in rain. Does this shed allow adequate ray to pass through the roof panels to act as a greenhouse for starter plants? Hi lamarshj, This shed allows 10% light transmission, through the roof panels. Thanks and have a wonderful day!